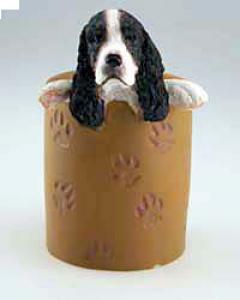 Spring into action and liven up your work space with this sweet Springer Spaniel Pottery. This can be used as a pencil holder or can hold a small desk plant. This precious little guy will fetch everyone's heart with his expressive face peeking out of your spectacular Springer Spaniel Cup. Standing at 5 inches tall, this gorgeous hand painted poly resin Pen and Pencil Cup will brighten up any desk, table or counter top. This friendly game dog makes the perfect gift or special treat for the true Spaniel aficionado.